Yes, I’m truly sorry. I didn’t mean to upset my cat readers. Next strip will be strip nr. 50, which is… cool. I’d never thought I’d make it this far. 😀 I hope I’ll make it in time, it’s a big one. This entry was posted on Friday, November 21st, 2008 at 4:00 am and is filed under Comic. You can follow any responses to this entry through the RSS 2.0 feed. Both comments and pings are currently closed. My cat is offended too. He dislikes your heightening of the common stereotype that cats use IE6. I’m sorry, Waiors cat. 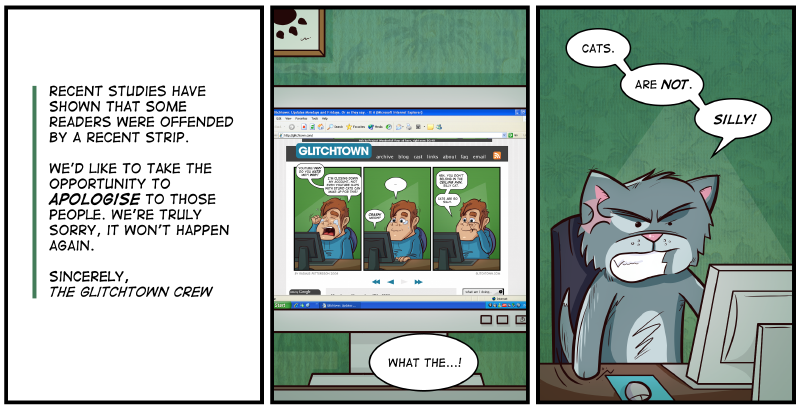 But I strongly believe that most cats still use IE6. Grymt bra jobbat med 50 strippar! Hoppas du håller ångan uppe, det har varit ett sant nöje att se serien utvecklas!